There are many ways to support Guilford Art Center, and we invite you to join us! Your donations help enable our mission to bring opportunities in the visual arts to all in our community.Guilford Art Center is a nonprofit organization, and the support of our generous, community-minded donors is essential to our operations and our ability to fulfill our mission. As is the case with most educational organizations, tuition covers only part of our operating costs.By supporting GAC, you are ensuring the inspired creativity of our community of artists, of all ages and abilities, and the benefits conferred by visual arts education, including critical thinking skills, visualization of complex ideas, holistic problem-solving, and opportunities for mindfulness, which are all essential in today’s global world. 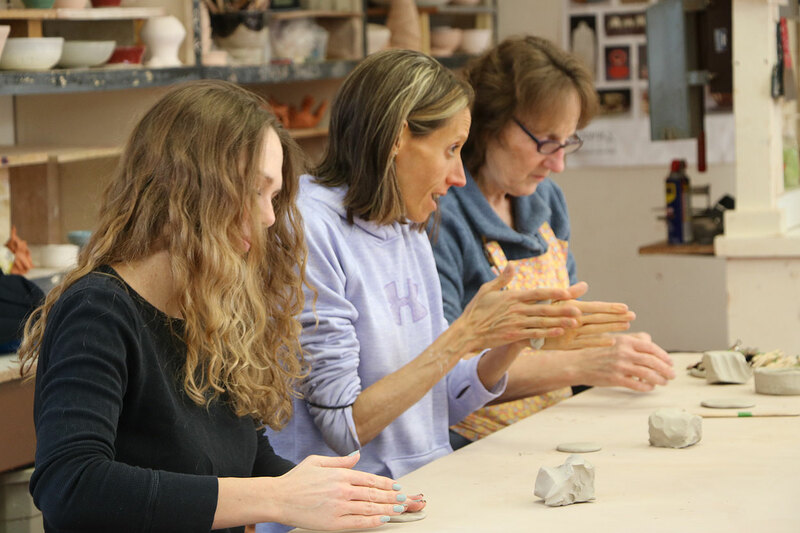 GAC’s School annually serves over 2,000 students, from preschool-aged through senior citizens, in approximately 400 classes annually, including ceramics, jewelry, metalsmithing, weaving, glass, drawing and painting, blacksmithing, and stone carving. Tuition assistance is available to help insure that the Center’s programs are accessible for students of all means. The Gallery presents exhibits of contemporary American art in all media and is open seven days a week, free of charge. Our Community Programs include our free, annual Open Arts Day; free class observation weeks; collaborations with other community organizations to bring the arts to our region. The Shop, including the Artistry Holiday Sale, features fine, handmade American crafts and helps to support creative artisans. The annual Craft Expo, held on the Guilford Green, features more than 180 of the country’s most distinguished artisans. As a celebration of the arts and a signature happening for our region, it is considered one of the top craft shows in New England and the country. To make your secure transaction online, please click on the Donate Now link below, and enter your contribution amount in the space provided. Suggested donations: $5,000, $2,500, $1,000, $500, $250, $100, $50, $25, or other.No PayPal account needed! Just click “Pay with Debit or Credit Card” on PayPal login screen. Please have your credit card information ready, and call the GUILFORD ART CENTER at 203.453.5947. If you work for a company that has a matching gift program, you may be able to double your gift! Please contact your company to find out more. For instructions on how to make a stock gift, please contact Suzanne Hens-Kaplan, Operations Director & CFO, at shens-kaplan@guilfordartcenter.org. Include Guilford Art Center in your long-term philanthropic plans. For more information, please contact Maureen Belden, Executive Director, at mbelden@guilfordartcenter.org. The Annual Appeal is a vital source of operational support for the Center’s programs and facilities. Your donation helps to provide affordably-priced art programs in our school, keeps our gallery and shop open and free to the public 7 days a week, and supports free and collaborative programming at the Center and in the community. No PayPal account needed! Just click “Pay with Debit or Credit Card” on PayPal login screen. Donations to Guilford Art Center’s 50th Anniversary Challenge Campaign help support important campus improvements to provide quality arts educational opportunities, programming and enhanced facilities for our community. In 2016, a generous private donor contributed $50,000 to Guilford Art Center as a challenge match, which we are thrilled to announce has been achieved. Now we are launching an increased “Phase 2” of the Challenge, with a goal of raising $500,000 for campus and programmatic improvements. Your donations to the 50th Anniversary Challenge Campaign help support this project. • CLICK HERE to download the 50th Anniversary Challenge Campaign brochure.